As a graduate student, I have to read a lot of papers. I read a lot of them online in order to save trees. It’s a real pain. I periodically have to scroll the page, and I frequently lose my place when I do so. And if there are two columns — as academic papers usually do — then I have to scroll up to the top, then back down again. 1. I want software that will recognize when a PDF is two-column, and munge it so that it displays twice as many pages, but aligned so that I can read the center column straight down. Then “down” will always mean “in the direction I’m reading”. Why keep the full width of the page? Why not chop it in half? So that if there is something that spans both columns (like a figure), then I can still see it in its entirety. I might have to horizontal scroll, but I’m willing to live with that. 2. I want an eyetracker to help me keep track of where I am on the page. Webcams are now cheap and widespread. Some computers have them built in now. I want my webcam to track where I am in the text and to put a yellow dot there. If my eyes move quickly in a direction that doesn’t follow the line of the text, don’t move the dot. If the eye tracker is good enough, as I get close to the bottom of the screen, move the page up a bit for me (but do it in a predictable way!) so that I can keep reading. If the eye tracker is not that accurate, I’ll turn the page myself, but I want the placemark to persist for a little bit when I move the page, so that I can find where I was. One way of doing this would be to have the coloring be very faint if my eye is moving around, but the longer my gaze stays on one spot, the more the color “burns” into the page. After a small amount of time — say two seconds — the color starts to fade. Note that this colored dot does not have to be my cursor. If the eye tracking is good enough, then I could perhaps use the eye tracker as a cursor, using gaze position to give x-y coordinates. When I raise my eyebrows up, register a click down; when I drop them again, register a click down. Acrobat (version 7 of paid Acrobat Pro) actually has some relevant tools built-in. 1. If a document has structure tags, then you can use View… Reflow to see the text in a single-column layout, the width of the window, in reading order. 2. If a document doesn’t have structure tags, you can add them using Advanced… Accessibility… Add Tags to Document. Acrobat has a mechanism that will do a fairly good job of recognising columns, figures that straddle columns, etc. and apply structure tags appropriately. It also gives a report on where it’s less confident about the tags it applied. 3. If a document has structure tags, but they are wrong, you can fix them fairly easily. Use Advance… Accessibility… TouchUp Reading Order… to show the Reading Order Palette, and highlight the blocks of structure in the PDF file. You can then mark figures so that they are distinct from text, mark headers and footers as part of the background, etc. 4. An alternate approach to 1, 2, 3 above is to add Article Threads to the PDF file. Use Tools… Advanced Editing… Article Tool to select a tool that draws article threads. 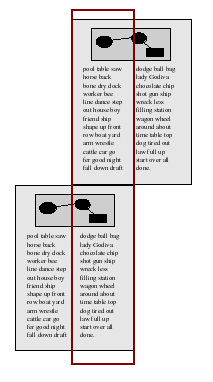 Use this tool to drag across the rectangles that make up an article, in sequence. This includes dragging across the first column, then the second. Now, switch back to the “hand” tool. When you move across a part of the page that has an article thread, a downwards-pointing arrow appears in the hand. Click there, and Acrobat zooms appropriately that the current part of the article fills the width of the window. As you read, click again with the Hand tool, and Acrobat pans and zooms as necessary to bring the next part of the article into sight. It will seamlessly move from one-column to two-column and back again, in the order you defined when you created the article thread. I’d make two observations about these tools. First, it shows that PDF as a file format permits authors to make more helpful or less helpful PDF files. If authors would take the time to put structure tags in PDF files they generate, then readers would have an easier time with reading. Authors should ask the makers of their authoring tools to improve support for generating structure tags. Second, it shows that features intended to provide accessibility to a part of the population have knock-on benefits for wider segments of the population. Structure tags that help the blind read PDF files with screen readers also help the sighted read on-line more easily. Curb cuts make it easier for wheelchair drivers to cross the street, but also for parents pushing prams, people using walkers, and roller-skaters.